This is is my latest crop of potatoes- Dutch creams and Ruby Lou. Just delicious. Now is the time to think about planting an autumn crop. Mostly people only think about planting potatoes in spring when all the “seed potatoes” arrive in the nurseries and hardware stores, but to extend your production you should be trying to plant successively (new plantings every few weeks) or in the least putting a second crop in autumn. Potatoes are a cool season crop but do not like it cold and frost will kill them. They need warm temperature for foliage growth and good foliage growth to develop a decent number of tubers of good size. They also require cooler temperatures to initiate tuber development ( soil temps of 16-19 degrees C or an average day temps of 21 ) and cool night time temperatures to encourage starch accumulation in the tuber which will increase the size. Therefore growing potatoes in autumn makes a lot of sense as they are planted when the temperatures are warm, which will promote good foliage growth, and then as the temperatures start to drop tubers will begin to develop. Potatoes take between 12 to 20 weeks to develop. I will be getting my final crop for the year in this weekend as our first frost often arrive in April ,but in milder areas on the coast you can start planting now and continue to plant up until middle of April for winter harvest. I always like to use seed potatoes as I know they are disease free however they are difficult to get a this time of the year . Try Green Harvest http://greenharvest.com.au/Plants/Potatoes.html or if you have good quality disease free potatoes these can be used. Shop bought potatoes are often sprayed with growth retardants so are difficult to get going and will produce lower yields- try your local farmers market and try and buy organic. I like the “chit” my potatoes before planting. To do this I place them in a light, (not direct sun) warm area and wait for them to start shooting. Potatoes like to be in full sun, with constant moisture but will rot if they are too wet. So a raised bed is ideal, I use the trench method of growing potatoes, simply because I find soil is finer and covers the tubers better then compost so they do not go green as they are developing. 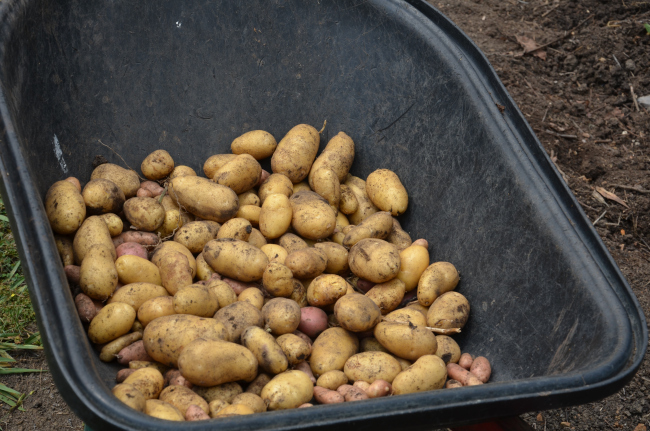 Have a look at this site which does a comparison of various methods of growing potatoes and find a method that will work best for you. So what do I do! Find a spot that has not had potatoes growing in it for at least 4 years, that is well drained and in full sun. Dig a shallow trench about 20cm wide. Place sprouted potatoes along the bottom of the trench, at about 30 cm interval, with shoot facing upwards. Cover gently (so you do not damage young shoots) with a mix of 50% compost /50%sheep manure. Try to leave tips of the shoots just poking out. As the shoots grow, cover stems with soil by backfilling the trench and them making a mound of soil around each plant. Each time you back fill only leave about four leaves sticking out the soil. This will need to be done at least once a week for the first 6 weeks. Sprinkle a handful of blood and bone around each plant after each back filling. Meanwhile for the first 6 weeks feed with ½ strength power feed twice a week. This will promote lots of strong lush foliage. Around 10 to 12 weeks stop watering. As the potato plant starts to put all it energy into tuber production it will start to turn yellow and eventually wilt. At this point the potatoes should be harvested. Gently lift the soil around the plant with a folk or shovel, making sure you are about 20cm out from the stem otherwise you can cut through the tubers. If you have any questions, jump onto Facebook or Twitter and join in the conversation! Generally, your local hardware or nursery will keep varieties that do well in your area.